CARRIAGEWORKS is Sydney’s other great secular cathedral. This vast late-19th century industrial space, originally built as railway workshops to make train carriages for the growing city, is less than a decade old as a centre for contemporary arts and doesn’t have the instant-recognition factor of the Sydney Opera House, but it, too, is awe-inspiring in concept, execution and purpose. Art of the newest kind finds a home within these history-laden walls. With Carriageworks’ current major offering there is a particularly brilliant marriage of project and venue. Three years in the making and involving artists from here and abroad, 24 Frames per Second is an important exhibition that, in the words of its organisers, “works at the intersection of dance, film and visual arts”. It’s not, however, dance as many people might understand it. 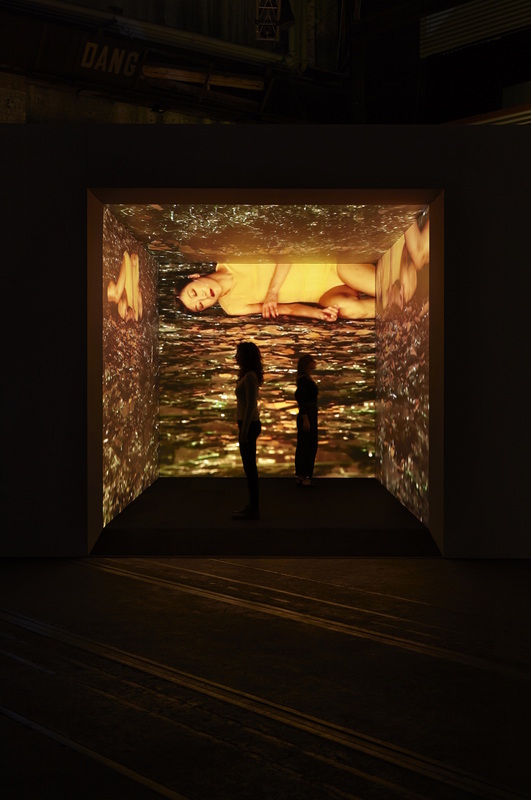 Co-curator Nina Miall acknowledges there was much discussion about how it might be defined: “It’s a broad understanding,” she says with some understatement. Not only does this understanding encompass the body in motion or even simply the presence of gesture – an exceptionally generous definition of dance – but also something more metaphorical, as in “the dance between analogue and digital”. One might even like to see the collaborations between artists who usually work in different fields from one another as a form of dance. (Adelaide filmmaker Sophie Hyde’s To Look Away lists 19 people in the credits.) It’s up to you really. As a result of this eclecticism the range is stimulating. Some of the artists are choreographers, including Japanese luminary Saburo Teshigawara, Bangarra Dance Theatre’s Stephen Page and the celebrated UK dancemaker Siobhan Davies, and others not. Some hadn’t worked in film before. Some use three-dimensional means while fulfilling the moving-image brief. There are short pieces and long ones, some with several parts and others on one screen. There are non-dancers doing what I would certainly call dancing and dancers not exactly dancing. Whatever 24 Frames per Second is, it is most certainly not an exhibition of dance films but it is built around the eloquence of the moving body and is audacious, experimental, technologically sophisticated and full of surprises. To see 24 Frames per Second clearly one must first surrender to the darkness. After walking through a kind of ante-chamber dominated by Khaled Sabsabi’s thrilling Organised Confusion, the viewer plunges into a cave of wonders in which the only light sources are the works of art themselves, placed within a vast hall (the area is about 6000 square metres; Carriageworks does big very well). Visibility is down to just a few metres. The senses are immediately heightened, and not only because dim light in an unfamiliar space brings its own particular frisson. There is a rumbling soundscape that turns out to be a mixed bag of the works’ individual soundtracks, each resolving itself more precisely on approach. Sound bleed may be the exhibition’s biggest technical challenge in an exceptionally technical show but the cacophony adds an enticing element of the unpredictable. The curators have arranged the exhibits splendidly. Some works are immediately visible although they may be intriguingly far away, others are tucked away in alcoves or, in the case of Letai Taumoepeau and Elias Nohra’s Repatriate, viewed in a narrow hallway. In between two walled spaces housing longer works (there are couches provided) it’s possible to see from a distance Sriwhana Spong’s The Fourth Notebook, a solo for dancer and choreographer Benjamin Ord using as a score a “semi-sensical” letter written by Nijinsky. One of the first works to claim attention is Tony Albert and Stephen Page’s Moving Targets, installed in a strong position not far from the exhibition entrance. 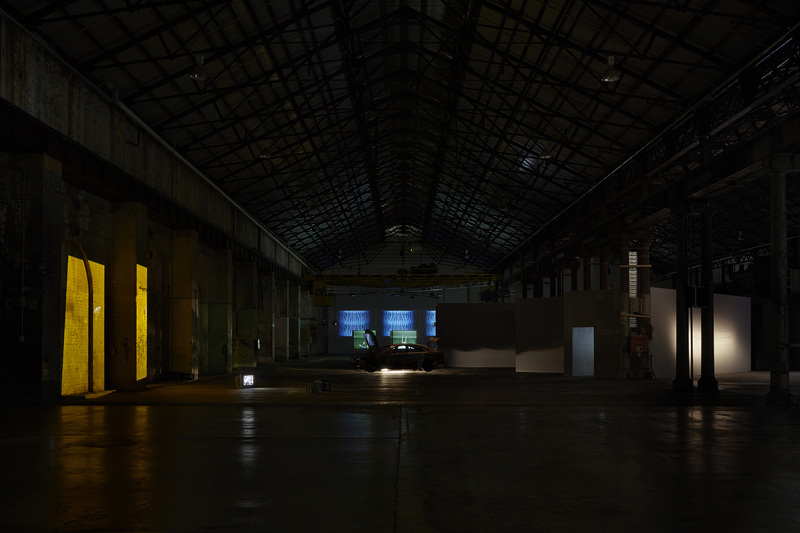 Moving Targets features screens inside the ruins of a stripped-back car – a work, incidentally, that will remind Bangarra patrons of dances by Page seen in the theatre. Walk to the end of the area and turn right, and two screens show Kate Murphy’s Lift and Push, austere, confronting and unsparing pieces on ageing embodied by enduring Australian dance eminences Robina Beard and Patrick Harding-Irmer. There is the sense of stumbling upon new things as one negotiates the space, adjusting eyes to the gloom. It takes time to orient oneself. On a third visit – and this is an exhibition to visit many times – I realised I still didn’t know exactly where everything was, which meant that works seen in a certain order on one visit were seen in another on a subsequent viewing. Given the different durations of the pieces, that fact changes the experience substantially. I do need to go again to immerse myself more fully in a few works I have really only glimpsed. Siobhan Davies and David Hinton’s The Running Tongue is one; Sophie Hyde’s gorgeous To Look Away, a quintet of video portraits featuring Restless Dance Theatre artists from Adelaide, is another. I also need to return to a handful of favourites. Christian Thompson’s Silence is Golden has a great backstory. 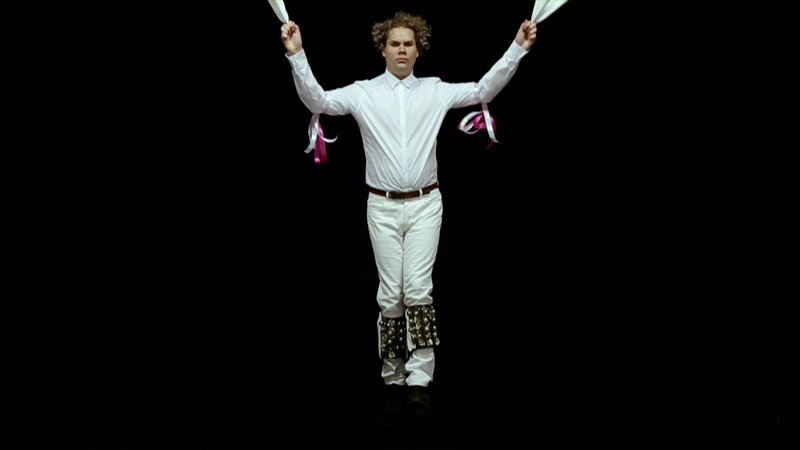 Thompson is a South Australian Indigenous artist interested in identity, culture, memory and history who discovered, while undertaking a doctorate at Oxford University, that one of his great-great grandfathers was from the English town of Bamford, famous for its long Morris dancing tradition. Morris is seen performing in traditional Morris garb in Silence is Golden, although not in a Bamford dance. Thompson was denied access, says Nina Miall. His connection, it appears, was not strong enough for him to be inducted into that town’s mysteries so he was taught something else by an expert in London. A work that drew me back again and again as I circled 24 Frames per Second is François Chaignaud and César Vayssié’s The Sweetest Choice, a cycle of five films lasting about eight or nine minutes each in which Chaignaud dances and sings. The setting is California’s Death Valley, the unaccompanied song is a baroque aria by Purcell O solitude, my sweetest choice! and the dance is described as “precarious”. The voice is fragile, the body is almost naked except for a shamanistic decoration of foliage and the choreography is elusive but the effect is mesmerising. And finally there is the inescapable adrenalin rush of Khaled Sabsabi’s Organised Confusion. Huge facing screens are filled with a crowd of fans of the football club Western Sydney Wanderers as they support and exhort their team. It is an expression of collective faith, identification, will and power as the group chants and moves as one. Organised Confusion is a two-part piece, contrasting the ebullience of the football fans with a series of small screens showing a single figure in a trance state, but I must confess I found it hard to tear myself away from the footy fans, hundreds and hundreds of individuals moving as one in an ecstatic ritual. Happily one can afford to go back multiple times to 24 Frames per Second, which is supported by the Australia Council. Admission is free. 24 Frames per Second, Carriageworks, Wilson Street, Eveleigh, until August 2.